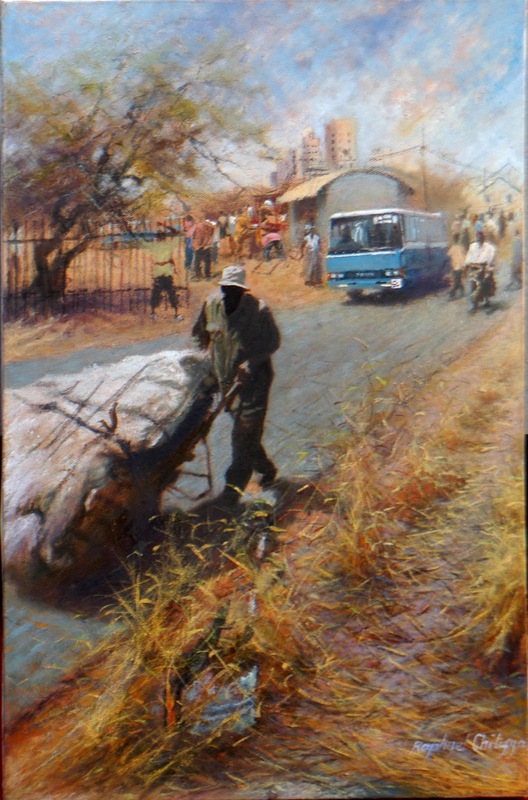 “The Custodians”, an exhibition of paintings and sculptures by top contemporary Zambian artists opens at 17:30 hrs on Friday 20th November at the Henry Tayali Gallery in the Lusaka Show Grounds. 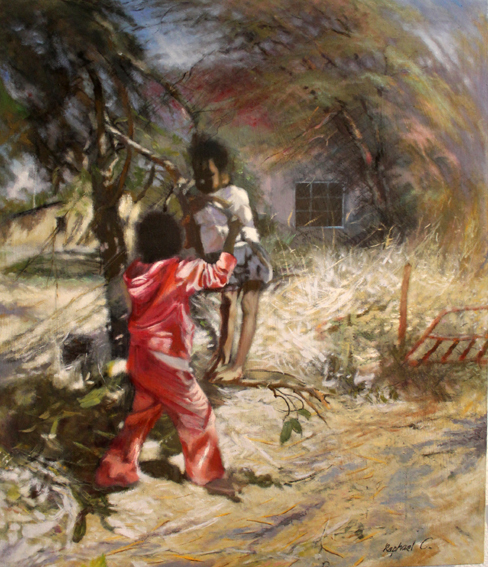 The Visual Arts Council of Zambia (VAC) will be presenting a show that comprises a body of work staging multiple themes while cultivating an explicit relationship between the present and the past by pitting some of Zambia’s greats, living and deceased alongside works by a younger crop of artists with great promise, as part of a fundraiser. As such, VAC will be charging a K20 entrance fee for the opening event, which of course will be characterised by an open wine and snack bar. The exhibition marks an important and new step in proving that as a space, the Henry Tayali Gallery and visual arts centre plays a fundamental role in offering testimony that against many odds, the country indeed has a flourishing visual arts scene and committed artists who are worthy of support, a point that is critical as definite political will is at long last on the horizon, vis-à-vis support for the arts from government – if of course President Edgar Lungu’s recent remarks and visit to the gallery are anything to go by. Just a year ago, VAC hosted a similar group exhibition entitled “Visibility (can you see us? )”, well that show’s title was self-explanatory, it was a call by the gallery co-ordinators beckoning private and public stakeholders in the visual arts, a call for support particularly of a financial nature, which has been dwindling over the years since the main foreign donor agencies and their government began tightened their budgets and shifting their aide focus for various reasons. The Custodians, nevertheless, is an equally important show, assuming now that VAC’s visibility has somewhat improved, it is really time for its members, paid-up and non-paid up to put their house in order. Over the years, the institution has been blemished by infantile bickering and finger pointing with accusations of individuals feeling they “own” VAC more than the next member as well as claims favouritism and opposing camps within the ranks, all this must come to an end if the council is to move forward as a unified body. When a call out is sent to all artists to pay up membership, they must all comply, when they are all called to an Annual General Meeting, they should all do likewise and attend. Someone wise once said strength is in numbers, can you imagine if every single Zambian visual artist were up to date on their annual subscriptions, the funds would definitely go a long way in paying the gallery staff as well as the building rentals to the show society for VAC, Lusaka. Currently VAC demands a small amount of K50 for individuals and K150 for institutional membership, these figures are almost a joke to any practicing Zambian artist regardless of the hard economic times, if anything VAC should consider increasing the fee to K150 for individuals and K1, 500 for institutions, if you do the maths there will be no more delayed salaries for art centre staff in Livingstone, Lusaka, Kitwe or Chipata. Also, if all the visual artists get actively involved in the council, they are bound to have a stronger voice and will be heard whenever they call for something. 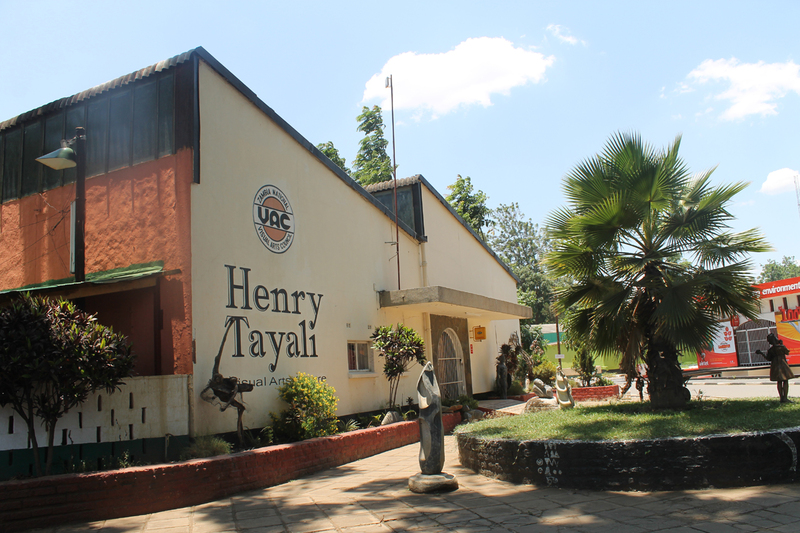 As for art students from the Zambia Open University and Evelyn Hone College, these institutions should make it mandatory for each and every student to be a paid up member – at a special students rate of course – school pupils and art clubs should be encouraged to join and told of the benefits of being affiliated to a professional body of artists. 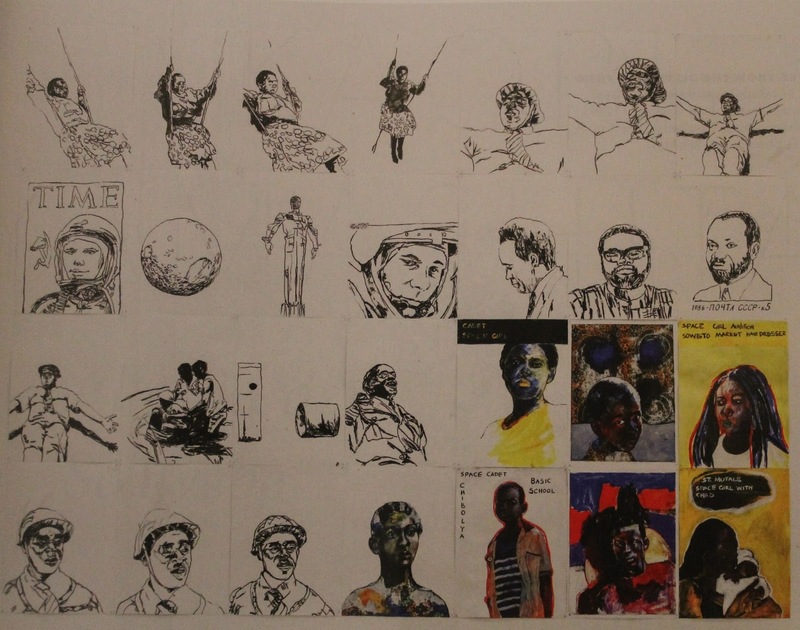 On the other hand, returning to The Custodians it is gratifying to note that among the featured artists, the gallery co-ordinators decided to include the late Martin Phiri. 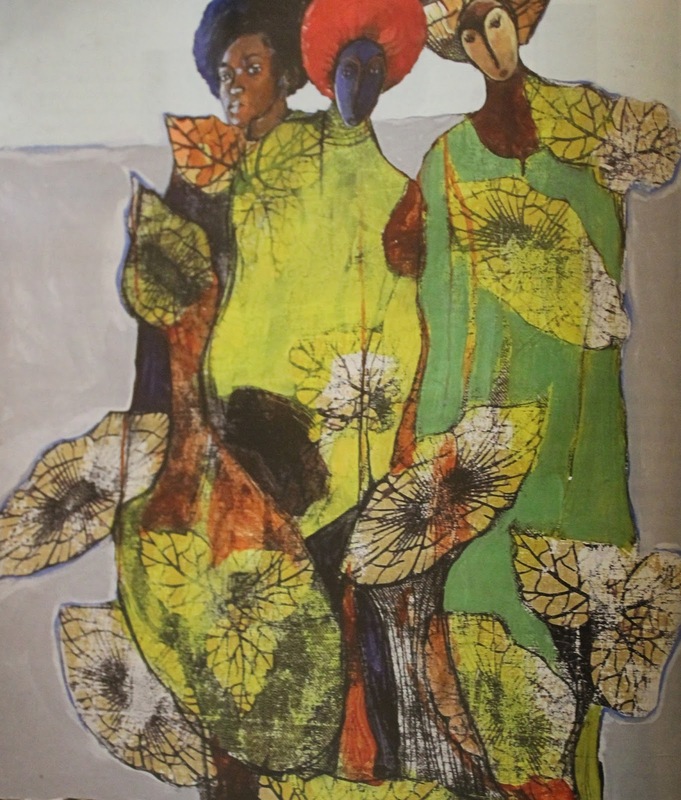 Phiri is arguably the most unacknowledged contemporary Zambian artist of his generation, which is quite regrettable considering the artist’s legacy. Truth be told, without him there would be no VAC at all, it is Phiri whom as a young lecturer at Evelyn Hone College in his late twenties elbowed his way into a high-profile cultural policy meeting chaired by Lazarus Tembo, the late singer who was also a government minister overseeing Labour and Social services at the time. Phiri, who had just returned from China where he had obtained a BA Fine Art at the Central Academy of Fine Arts, Beijing and was obviously inspired by the students uprising of that country, argued that the cultural policy that was being created lacked visual arts representation and demanded he be given a month to organize artists and create a nationwide, professional body. 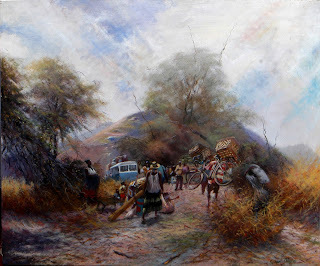 Along with three of his students, William Miko, Harry Kamboni and Agnes Buya Yombwe, they were able to pull off this immense task and mobilize close to 100 artists from all over the country to gather for a meeting at the Evelyn Hone College, this was the birth of VAC, mind you this was way before the e-mail and cell phone era. This is not to say Phiri has been entirely forgotten, of course the VAC offices in Chipata are named in his honour, but the man at least deserves a retrospective show to bring awareness to his contribution and work. 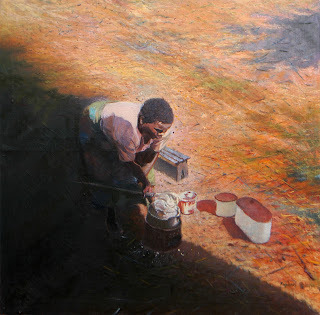 In any case, The Custodians is set to be an entertaining event, other artists featured in the show are Zenzele Chulu, Lombe Nsama, Adam Mwansa, Agnes Buya Yombwe, Chansa Chishimba, Charles Chambata, Danny Lwando, David Chibwe, Eddie Mumba, Mwamba Mulangala, Stary Mwaba, Sydney Siansangu, Nukwase Tembo, Patrick Mweemba, Patrick Mumba, Poto Kabwe Flinto Chandia, Gladys Kalichini, Lawrnence Yombwe, William Miko, Lutanda Mwamba, Raphael Mutulikwa, Vincentio Phiri, Mulenga Mulenga and Geoffrey Phiri. What does the ‘Afrofuturism’ spirit mean to Zambia today? Athletes are always said to fly their nations flags high during the course of their endeavours, certainly the Zambia National Football team did so when they won the 2012 Africa Cup of Nations, the Zambia National Polocrosse team did so when they reached the world cup finals this year, sprinter Sydney Siame did it with a good performance at the 2015 World Championships in Athletics in Beijing, and the Phiri’s Esther and Catherine – no relation – do it whenever they face an international opponent in the boxing ring. With due respect to these outstanding flag-carriers, it can be argued that only an artist has the ability to fly the national flag higher than them, well figuratively, an artist has the ability to place the flag on the moon or mars and this is exactly what Lusaka-based artist Stary Mwaba did -- while he was in attending a one-year residency through a grant by KfW Stiftung for the International Studio Programme at Künstlerhaus Bethanien in Berlin -- by creating work inspired by the late Zambian visionary Mukuka Nkoloso. Berlin art critic and author, Kito Nedo gave a stimulating account of Mwaba’s work from his solo exhibition Life on Mars that was published in the high-profile contemporary German art magazine BE shortly after the exhibition in early 2015. Life on Mars was the culmination of a series of exhibitions that started with a show at the Lusaka National Museum in 2014. Nevertheless, there is perhaps no such thing is claiming sole ownership of a philosophy but to a large extent Mwaba’s recent show was an attempt to reclaim not only Zambia’s positions in the space race but also the nation’s slot in inspiring contemporary African thought. That said, Nedo points out that archival images from the Zambia National Academy of Science, Space Research and Philosophy, which Nkoloso founded on a farm outside Lusaka, hugely inspired the Mwaba’s work, and he also asks a pertinent question of what Afrofuturism means to Zambia today. “What does that past Afrofuturism spirit of departure mean to Zambia today? 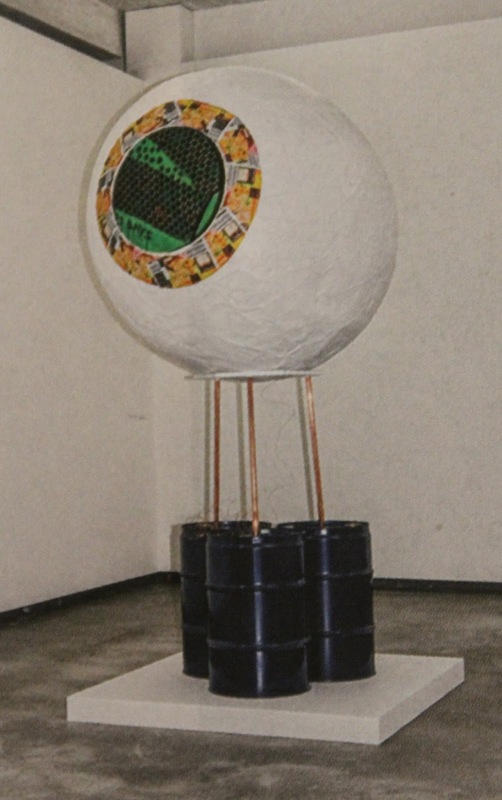 He is also interested in the aesthetic-political content of the Nkoloso programme: its assertion of African space travel conjures a powerful counter-image to the dominant colonial narrative, which sees Africa merely as a backward, chaotic, low-tech part of the world”, observes Nedo. “It is easy to view the academy as some kind of joke. But in the country that had declared its independence from the United Kingdom on 24th October 1964, such utopian efforts were part of post-colonial euphoria. The cradle of the Afronaut movement lay in Lusaka: today pioneering figures like Nkoloso still electrify artists with an Afrofuturism tendency”. Zambia fell out of the space race after Neil Armstrong landed on the moon on 21 July 1969, this thwarted Nkolosos plan to get the 17-year-old Afronoaut Matha Mwambwa and two cats on the moon before the Russians and the Americans. Still, a closer look at Mwaba’s featured work will show concur that the artist has once again managed to transform himself making him a hard act to follow. In Lusaka, he is largely know as a painter, but in Berlin he showed some collages, and three dimensional mixed media installations among them The Spaceship (D KALO 15) inspired by Nkoloso’s spaceship, what is perhaps most important is that Mwaba is an artist of a humble academic background, but he was able to marry his recent practical work with complex conceptual notions which worked well for the Berlin crowd that is more accustomed to this type of theory-based work. But this along with many other of Mwaba’s successes over the years is in itself problematic. 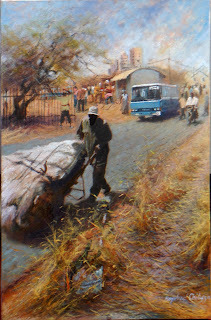 Because he has managed to penetrate the global arena with no training except the apprenticeship he underwent with the late Lutanda Mwamba in his formative years, he remains an internationally exposed, workshop-trained artist who fuels the notion that academic training is not a prerequisite for success in the art world. While this is true to Mwaba and many other artists around the world, the fact remains that academic training is undeniably necessary for an artist in today’s global art world, just because Mwaba has made it does not mean everyone else should take the same route. Academic qualifications are not only a safe thing to have as an artist but with the impending streamlining of the creative sector in Zambia, one can imagine those with ‘papers’ stand a better chance at receiving artists grants, getting jobs within the industry and so on. Academic training also opens the mind to analytical thinking which can become useful in informing an artist’s work to a higher level. From the tender age of 10, Luanshya-born painter Raphael Chilufya’s restless imaginative spirit indicated that he was on a one way path to become an outstanding artist. Creativity was his itch and art was his scratch. “I could not control myself when I was a young boy, I just had to draw with anything, on anything, the walls, the road, even in my school books, from the time I had access to pencils,” he says. But he began to take art seriously while in grade four at Kansumbi Primary School except it was only two years later while in grade six that all his friends yelled out his name when a call for entries to an art competition was announced during assembly. He entered and eventually won this competition and never looked back. He was not happy because managing a transport business meant waking up at ungodly hours to be on the ground with the fleet as well as spending long hours at an accounts desk, managing figures; this meant he had not time to practice his true vocation. “I was glad to discover the Central African Correspondence College from Zimbabwe which allowed me distance learning, so I enrolled in a course and struggled to do art and work with buses as at the same time. Then Evelyn Hone College launched a two year graphic design course and I quit work and enrolled in 1992 because it demanded that I should be there full time,” he says. Upon graduation in 1995 he joined the industry and worked for a string of printing houses and creative establishments among them Mojo Press, Piltcher Graphics and Moore Pottery, during this period the newly formed Zambia National Visual Arts Council (VAC) was in need of new members Chilufya got involved in mobilizing recruitments through the Imiti Ikula (growing trees) project for younger members alongside notable artists such as Geoffrey Phiri, current VAC vice-chairman Zenzele Chulu, and current chairman Mulenga Chafilwa as well as artist turned journalist Ms Diana Mulilo. “Although I had a job, as the younger group at VAC, we couldn’t afford or find materials so we were usually helped by the likes of Godfrey Setti, William Miko and also s Zukas helped us with money because we used to sleep at the Henry Tayali gallery and vowed never to shut its doors like a police station,” he recalls. Eventually their beloved workspace at the gallery was turned into a restaurant by new management and the Imiti Ikula group also outgrew their alliance for independent careers in the visual arts, some joining teaching practice, others choosing their own personal space while Chilufya decided to head south for inspiration. 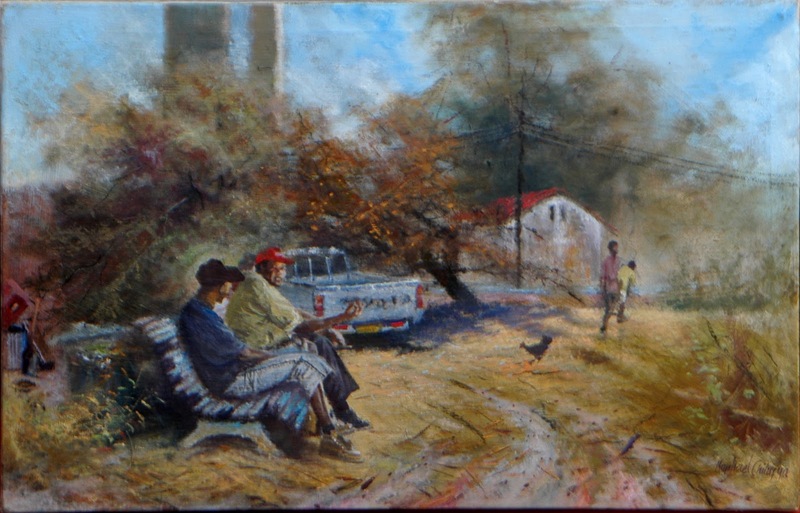 His venture took him to Mbabane, Swaziland where he successfully held shows at Gallery.com and Indingilizi Art & Craft Gallery. He moved on to South Africa where he was offered a contract with a black empowerment corporation in Limpopo but could not stay long because it demanded that he work for two years before he could come home to Zambia and marry his fiancé and settle with her there. Chilufya retuned to Zambia from his foreign adventures after 2002, settled down married his fiancé and returned to practicing as an artist in Lusaka. 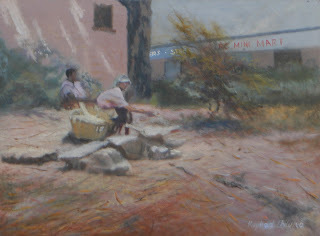 Describing himself as a “social environment observer”, he remains one of the country’s finest figurative oil painters of everyday life and his style can easily be identified by the hazy character of his brush strokes and soft palette which could probably be described in fine art terms as a cross between Scumbling and Sfumato. He has been widely collected both locally and overseas, his works can be viewed or purchased from the Henry Tayali Gallery in the Lusaka show grounds or Twaya Art Gallery at Intercontinental Lusaka. (The print version of this article was first published in the August 2014 edition of Zambia’s Bulletin & Record magazine under the title The wandering artist as social environment observer). Very little was known about the president at the time be it his personal character or his plans for the country. 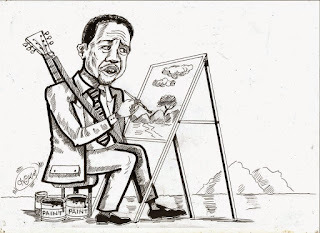 As for the arts, the speculation was worse as to whether he would consider them like his predecessor and mentor Michael Sata whose legacy, the realignment of the Tourism and Arts Ministry and the Arts, Culture and Heritage Commission Bill was a huge step forward, that gave hope to notions of a legitimate creative sector with the trappings of a national budgetary allocation and job creation. But in August, seven months down the line, the President appeared to give the arts a first flicker of hope during a trip to Botswana where the Zambia Daily Mail’s Steven Mvula reported that the president had observed that the Zambian art scene was sterile. “Zambia is lagging behind in terms of arts and theatre. The creative industry can give our women and youths a decent living. NAC is no longer doing what it is supposed to be doing. That is my own assertion. But we will be sitting down with colleagues and ensure that bickering comes to an end. We will see to it that the issues that are making the Council not deliver are sorted out,” stated Mvula quoting the president’s response to a question while the head of state was addressing Zambian’s based in Botswana. On Friday, 18th September, a month later, the president was making his official speech for the opening of the National Assembly in Parliament; of course politics being what they are, the speech was hauled over the coals by the opposition and critics, cited as empty and unworkable rhetoric in the midst of an ailing economy and the soaring cost of living that accompanies it. But surprisingly somewhere in this alleged drivel, he kept his word on looking into to the issue of the country’s shambolic state of the arts, giving the subject prominence, and likewise giving the artistic community another flicker of hope. “The Minister responsible for Tourism and Arts will bring to this House the Arts, Culture and Heritage Bill aimed at harmonising institutional arrangements in arts, culture and heritage to reduce overheads and promote cost effectiveness,” read his speech in part. In a segment where he announced that he had directed the Secretary to the Cabinet to ensure continuous improvement to institutionalised pubic services, President Lungu declared that arts, culture and heritage, despite having economic potential as sectors had either been “overlooked by policymakers or inadequately addressed with piecemeal or traditional approaches”, and that this had created challenges in coordination, planning and resource allocation. “Consequently, opportunities have largely not been effectively utilised in not only creating a vibrant national identity, but also in tapping into a sector that can contribute meaningfully to our economic growth and major contributor to the job or career market,” read the speech. The speech pointed out that his predecessor directed the Ministry of Tourism and Arts to establish a National Arts, Culture and Heritage Commission as a directive that was intended to accelerate the creative industry’s contribution to economic development. “In this regard, the repeal of the National Arts Council of Zambia ACT, No. 31 of 1994, is fundamental to the successful implementation of the directive. I am happy to inform you Mr Speaker, and Honourable Members, that my government with the input of stakeholders in the creative industry, has worked hard to produce the draft culture and heritage bill which will be brought to your attention before the end of the year. “This house has already supported the initial funding to create a national arts, culture and heritage commission as reflected in the 2015 budget in which an amount of K3, 500,000 was approved by this parliament for this purpose. The newly created commission will improve the coordination, administration and management of the arts, culture and heritage sector in this country” read the section of the speech under the title Arts, Culture and Heritage. But a month after his speech in parliament, the president gave the arts a third flicker of hope when on 17 October he officially opened the National Art Exhibition at the Henry Tayali Gallery and signed the visitors book, in it, leaving remarks that tally with his parliamentary speech. “Let’s create a living for our people out of their talents by making art an economic activity”, wrote President Lungu, stamped and dated “H.E. Mr. Edgar C. Lungu, President, and Republic of Zambia”. Well, at long last, there finally seems to be quantifiable political will towards supporting the arts, complete with a presidential stamp of approval, the pursuit of this approval of which has been a hymn for the past decade in this column, giving a voice to the many individuals that have incessantly campaigned for this direction. No doubt there is jubilation particularly in the visual arts community as they have often felt the most neglected in terms of private or public sponsorship compared to their counterparts in music, film, fashion, theatre and the literary arts. But as artistes across the creative field await the bill to be passed, it must be noted that government sanctioned support may bring along its own problems. If you look at all the three instances mentioned here Botswana, Parliament and the Henry Tayali Gallery, the President is talking livelihood vis-à-vis job creation and he is also talking figures, which means money, all of which are a sound recipe for greed. It can be argued that greed and not necessarily the lack of sanctioned support has been an impediment in Zambian arts administration at every level for a very long time where we individuals who have personalized the respective arts governing bodies that they oversee and have created miniature empires in them, these are individuals who do not see anything beyond the next workshop allowance or foreign conference that benefits no one but themselves. So instead of just a name change and reshuffling of these bodies into so-called commissions, there will be need for an absolute overhaul, or purge for lack of a better term. Nevertheless, for the creative sector to be fully functional as a player in the country’s economy as seems to be the President’s vision, there will be need for infrastructure. Zambia has no national theatre, no national gallery, youth art centres for developing talent and the two major universities do not regard the arts as a field of academic study. Zambia has no gallerists, no curators, no arts agents and no arts scholars to critique the arts after all the arts are developed by professional and academic evaluation. The sector is going to need training and qualified staff if things are going to work, the sector will also need proper professional regulation where only registered artistes will be eligible for grants and opportunities to avoid a free-for-all, “sangwapo” situation that may defeat the indispensable purpose of professionalism. It was written in this space just a couple of weeks ago that in Germany, the city of Berlin alone generates an annual income of over 700 million euro and has 6,600 employees, well this of course is not by accident, there are more than 400 galleries and over 2,600 active companies within the Berlin art world, so investment in infrastructure is inevitable. It was also mentioned that Art school graduates as well as individuals who work in the creative industries are eligible for a wide range of financial assistance from the German government and that merely the show of a university degree from an art school officially guaranteed you to be labelled a “professional” artist meaning artistic grants and scholarships be benefited from the state, applying for a government grant is the equivalent of applying for a job. Ultimately by so doing, the German government was enviably tackling a thread of unemployment. In Germany all arts funding is administered on two levels, municipal and state. This is because through research, it has been observed that local arts administrator know the interests of their communities better, they also know the quality and needs of the artists who live there. It should also be mentioned that most of Berlin’s art does not stay in the city or in Germany it is exported to the global art, London, New York, Paris and so on, similarly, the world’s major galleries have found a hunting ground for young talent in the city, which also attracts foreign young artists. Of course the German model might sound like a very foreign, first-world and extravagant example but it is testimony that investing in the arts, both through infrastructure and education can provide fruitful results. Unquestionably, the placing of infrastructure and the restructuring of higher education to make the sector viable may be a long term project, but as soon as government policy falls in to place to fund the arts, the first and most straightforward things to do is launch annual international arts fairs and invite the world to participate, this would not only help showcase Zambia to the world – which also seems to be the presidents concern – but it will also fill hotels, guest houses, sell out car hire companies and fill the pockets of the tour guides instantaneously. It has been done before and can be done again, all that was required was the political will. Indeed, Zambia may not have the expertise at the moment but neither did it have the expertise when it held the International Art Exhibition or National Exhibition of Art and Culture in 1964. 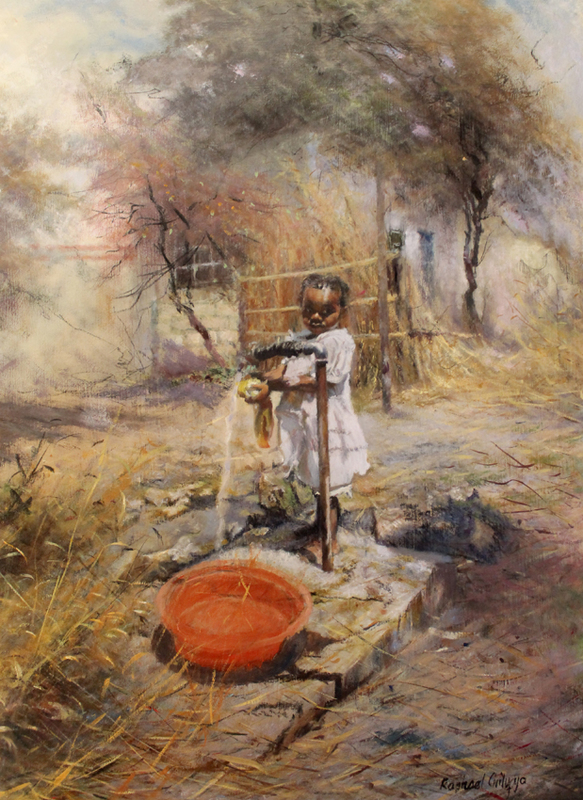 As highlighted recently, coming from a restrictive academic system towards locals, as a new nation, Zambia did not yet have academically trained artists or curators in, so Frank McEwen from the Rhodes National Gallery in Salisbury, Rhodesia (Zimbabwe) was brought in to put up the display. Modern art giants like Picasso, Braque, Brancusi and Henry Moore were his personal friends and he often shipped their work to Rhodesia for temporary display, so bringing such a character in was no mean achievement. 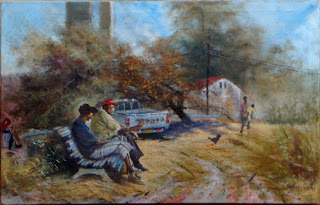 Of course 50 years down the line we do have capable Zambians that have been doing and are still doing an outstanding work under the circumstances, but the ability to hang paintings in a gallery does not make one a curator, one does not just wake up and label themselves a curator as much as one does not wake up and say I am a chef, a doctor, an accountant or a pilot. Unfortunately the job demands a lot of things like the scholarly formulation of artistic themes and the meticulous selection of work not to mention the publishing of opinion shaping exhibition catalogues that can be presented as scholarly literature at any international art symposium, museum, gallery or in a university library. The problem is that as Zambians we have the habit of betraying the truth by not admitting when we do not know what we are doing. 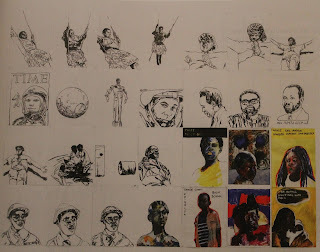 In 2013, again as published in this column, Angola was in a similar position as Zambia is today, virtually unchartered territory on the global art scene, eager to introduce itself the Angolan Government through the Ministry of Culture hired Stefano Rabolli Pansera, an Italian curator to work with a local team and sponsored a pavilion at the Venice Biennale, which is considered the Olympics or World Cup of contemporary art. The Angola pavilion was in the Cini Palace alongside the heavyweights, Germany, France and Denmark to name a few. Much to the world’s amazement, Angola stole the show and was honoured with the coveted Golden Lion Award for the best pavilion, making it the first sub-Saharan country to do so defying the odds against some very stiff competition. The Angolan artist Edson Chagas who was featured in the space used it as a launching pad and is now booked all year round at international galleries, art fairs and museums, flying his country’s flag high.